This graphic organizer allows students the perfect pre-writing activity. It visually gives them a place to organize their thoughts before they begin drafting out their narrative poetry. This is a 2 page worksheet. 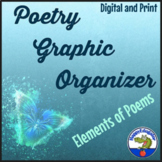 Poetry Graphic Organizers- National Poetry Month - Analyzing Poetry - Similes and Metaphors - Cinqauin, Limerick, Acrostic, Concrete, Haiku, and more! 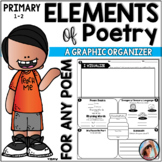 A primary grades-focused graphic organizer for students learning to read and analyze poetry. Two levels of difficulty included, perhaps for earlier and later in the same unit. Opportunities for rhyming words, visualization, summary of meaning, language of poetry, mood, and message. 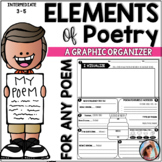 This organizer will help your students apply their learning of the elements of poetry at the fourth grade level to any poem. As indicated by Common Core Standard RL.4.5, it includes lines, stanzas, rhythm and rhyme, repletion, and 3 forms of figurative language: idioms, adages, and proverbs. 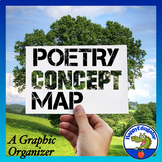 This poetry graphic organizer includes sections for poetic form, structure, sound devices, figurative language, tone, mood, setting (for narrative poetry), imagery, graphical elements, and theme. Here are some graphic organizers for: Haiku I am Limerick ABC poems Enjoy! Please don't forget to rate! Help your students stay organized with this graphic organizer. For this particular poem I required my students to use at least one form of figurative language. Graphic organizer for analyzing characteristics of poetry. This is a .doc file, so you can add in your own titles or characteristics if needed. Also allows students to choose from their own selections of poetry. 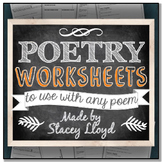 Enrich your student's knowledge of poetry with this easy to use graphic organizer. Students analysis poetry based on Common Core Standards. The organizer also includes a cute poster to help make learning fun. Graphic Organizer to go with the assignment: 'Make the World Great Again' - Two Voice Poetry Mini Unit This file includes a Venn Diagram for students to brainstorm the two perspectives they will be writing from, as well as note page for them to start drafting their 4 stanzas. Poetry graphic organizer that works with any poem. Helps students analyze historical context, paraphrasing, literary devices, mood and tone, and rhyme and meter.